The bus systems in Mexico is a great way to get around the country with safe, affordable, and comfortable service. We found that in the states of Yucatan and Quintana Roo, the colectivos are more organized and better operated than what we have experienced in other Mexican states (namely Chiapas) and other Central American countries (namely, Guatemala and Nicaragua). For instance, the colectivo we took from Playa Del Carmen to the Cancun bus station cost $34 MXN per person, then an ADO bus from the Cancun bus station to the airport (which leaves every 15 minutes) for $64 MXN per person. There were group shuttles from Playa Del Carmen direct to the Cancun airport cost around $20 USD per person. In Playa Del Carmen, the colectivos gather near the park at 20 Avenida Notre and 2 Calle Norte. They don’t leave until they are full but this happens quickly. Also, the drivers had uniforms which, in my opinion, makes them seem more legitimate. But with this legitimacy comes higher prices. For example, when in Bacalar, we went to the bus station to ask about times and prices for getting to Mahahual. The Mayab bus cost would have cost $74 MXN each way with only two buses leaving every day whereas a colectivo driver said that the ride on his bus (which comes about every hour) would cost $70 MXN. We took buses from ADO stations in both states and were very happy with the service, the condition of the buses, and the prices. When we looked at the ADO schedule online, only ADO buses are shown. But there are actually four bus companies that work out of the ADO stations we visited; ADO, Caribe, Mayab, and Oriente. Sometimes, we found that there were more buses running than what was listed on ADO’s website, sometimes not. We made a habit of going to the station and asking to see the timetable on the ticket agent’s computer. While this does not help to plan ahead of time, it was helpful when planning our next move. 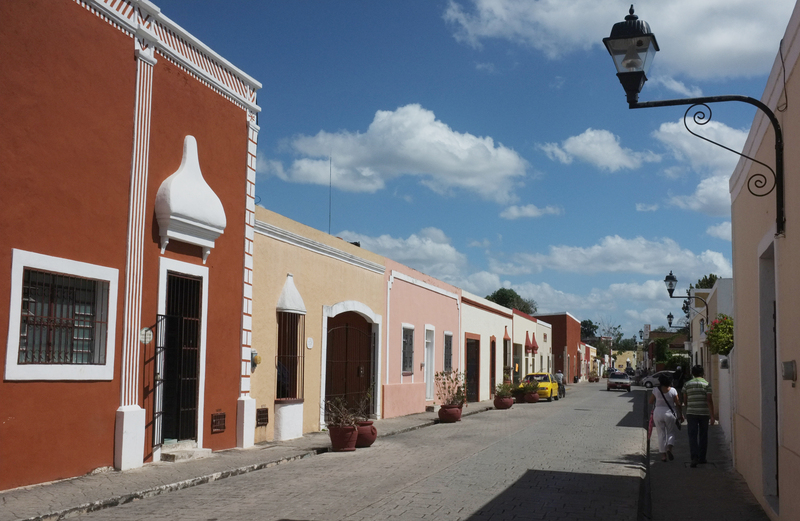 We had planned to cross into Belize from Chetumal for a few days and visit Lumanai but when we did the math of transportation, exit taxes for both countries, and a hostel in Orange Walk, we thought twice about it and ended up getting a great tip about visiting the town of Valladolid. 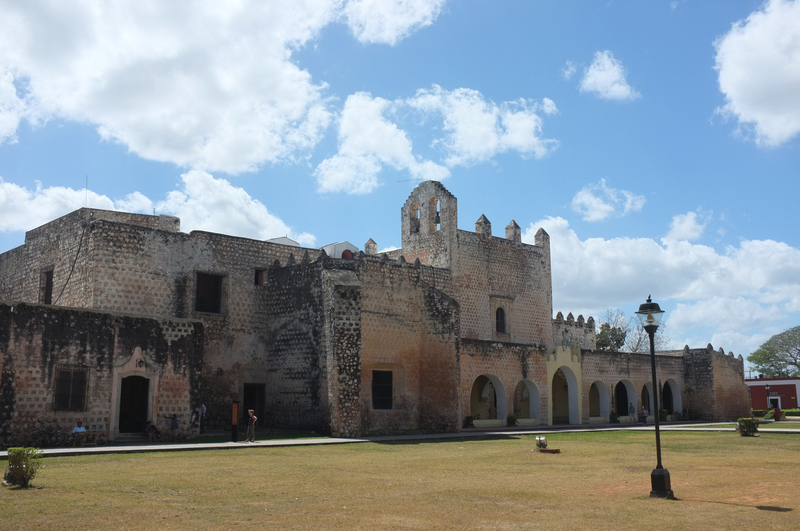 We took a Mayab bus from the ADO bus station in Bacalar to Valladolid for $186MXN per person. The trip took about 4 hours and dropped us off right near the center of town (the bus station in Bacalar is on the main road out of town which is a hike from the lakefront.) We walked a few blocks away to Hotel Zaci. For $56 USD a night we had a “premium” room (which took us three tries before finding one that wasn’t smelly and had a working A/C unit). We got a clean room, A/C, cable tv, hot water and wifi in the room and there was a small pool in the courtyard. The staff was helpful, though not enthusiastic, and none of them spoke English to my knowledge. But the location was close to the center of town. There is not a ton to do in Valladolid but we wandered the beautiful colonial streets, visited the ex-monastery, and took the free tour of the cacao shop in town. Cheap, delicious food was on every corner so we ended up eating at as many torta/taco carts as possible. The standard taco or torta cost $15-20MXN. Some carts had more options than others; onions, refried beans, etc. All had at least one meat option and multiple salsas. Spanish was necessary to order but well worth the effort exerted. We found a small restaurant with multiple menu del dia options. For $45MXN, you choose one of eight menu options. I had the pechuga de la plancha (grilled chicken) which came with a salad, rice, tortillas, and black bean soup. It was delicious and very filling. The restaurant is located behind Parque de la Candelaria on Calle 42 between Calle 33 and Calle 35 (streets running north and south are even numbered and streets running east and west are odd numbered). photo of food and of location go here. We also found a local bar on Calle 35 between Calle 44 and Calle 46. We grabbed a table and two drinks; a beer and a cuba libre. Soon after our drinks were ordered, our waiter brought a few small dishes of food to our table. Afraid that we were about to get fleeced, we asked what was going on. He told us that the snacks were included in the price of a drink. After another round of drinks, even more food was delivered to our table; chips and salsas, refried beans, hot dogs in a onion sauce, etc. When the bill came, we couldn’t believe that we hadn’t been taken for a ride, and only paid $150MXN before tip. Our bellies were full enough from the snacks that we skipped dinner that night. While in town we visited the Cenote Zaci. 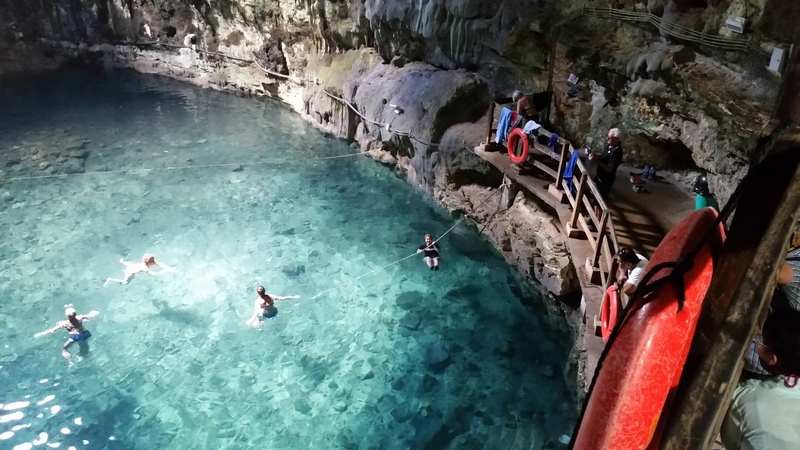 For $25MXN, you could enter the cenote and swim in the fresh water. We also wanted to visit a cenote outside of town. We found information on Tripadvisor stating that there was a cenote about two miles out of town. As we found out the hard way, this information is not correct. We mapped this information and decided that the next morning we would run there. After a 2-mile run from the middle of town to a major intersection on the highway, we asked a passing taxi if we were close and he said no. So, with the help of Google (and hoping to God that we would not be led astray again), we plotted a course for the next closest cenotes, Samula and Xquequen. It was only another 3 miles away. So we walked. I tried thumbing for a ride but it got us nowhere. But we arrived soon enough and we paid to enter one of the two cenotes. The entrance fee for each one was $61MXN. After a refreshing swim, we took a taxi back to Valladolid for $70MXN. Supposedly there is a colectivo that stops at the end of the road to the cenotes (a 15 minute walk from the entrance), but I can’t be sure. When I read about Bacalar and it’s beautiful lake, I was intrigued and beyond excited to spend some time there. I wasn’t sure if it would stand up to my expectations but it did and I’m thankful that I gave it the chance. I found Bacalar described as a “cottage town” for vacationing Mexicans. While we did come across other travelers from the U.S. and Canada, our numbers were limited. Spanish is definitely necessary to visit this town. The guides we hired and a few taxi drivers spoke English but for the most part, Spanish is the language for most transactions. We stayed at Casita Carolina which is only a few blocks from the center of town. This small property has a handful of room options that range from two small trailers ($300 MXN and $350 MXN) to a large palapa style room ($700 MXN) which sleeps four. The staff was very helpful though only the caretaker spoke English. 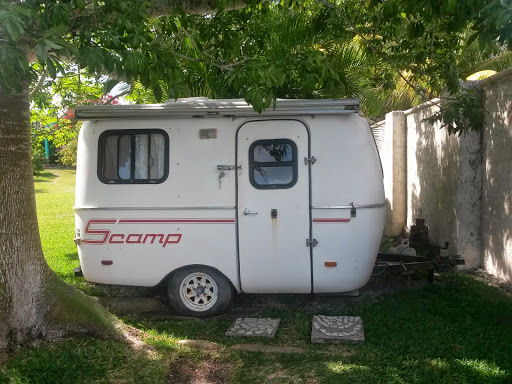 We stayed one night in the Scamp. It was a tight fit, but for $350MXN per night, it was a great deal. While in Bacalar, we took a half-day tour of the lake with a man named Amir. He tended to visit a handful of the hotels and hostels in the morning looking to round up 6-8 people for a tour starting around noon. While he was not the only person offering a tour like this in town, we were very happy with the experience we had with him. The tour included stops along the lake including snorkeling in one of the cenotes, swimming in shallow water near mud which is rich in sulfur (great for your skin), and swimming/snorkeling in “the rapids” which is a canal with a light current much like a lazy river. 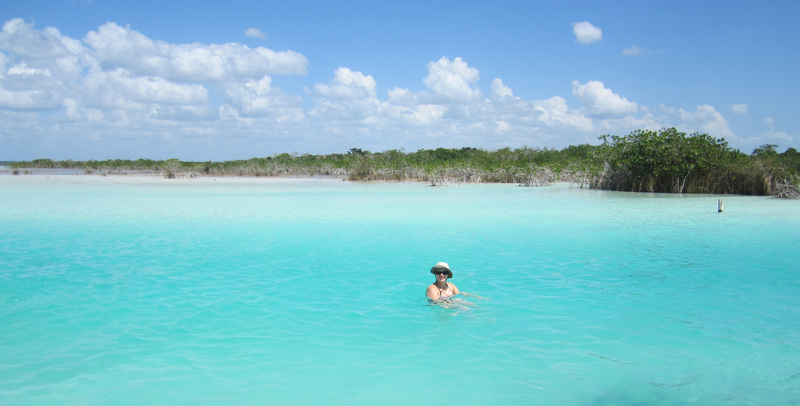 At $400 MXN per person, this tour was one of our favorite activities while in Bacalar. Lake Bacalar in all it’s beauty. When we weren’t enjoying the lake, we were eating all the delicious food we could find and it was plentiful. There are a few restaurants on the zocalo (town square) that were more geared toward tourists; menus were offered in English and Spanish and the prices were higher than in the rest of town. We ate an early lunch at one of these restaurants and for a plate of three tacos and huevos al gusto (eggs with ham, rice, and beans), we paid a total of $130MXN. And while the food was tasty, we had a similar meal at a restaurant off the the zocalo and paid around $75MXN. The two restaurants we enjoyed the most where on the same block. El Socio is open for breakfast and lunch and the other one (name unknown), two doors down, is open for lunch and dinner. Each restaurant is on either side of Toto Blue Boutique Hotel. Both restaurants are basic in their options, the service was friendly, and some basic Spanish is needed. We also wanted to visit some of the Mayan ruins near Bacalar. 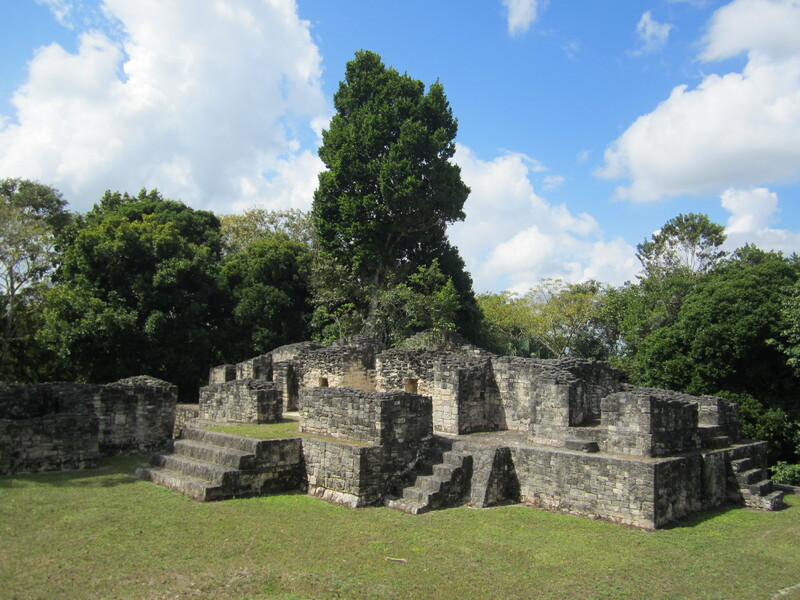 There are three sites within a 1.5 hour drive from Bacalar; Kohunlich, Dzibanche, and Kinichna. The caretaker at Casita Carolina, Kim, said she had a line on a bilingual guide. She said that he charged $500 MXN per person but this did not include transportation. It would be up to us to negotiate a price for a taxi or private driver for the trip. We had heard that most taxis would drive you around all day for $600 MXN but had also heard it could be as much as $1000 MXN. We thought this sounded a bit high so we went next door to the Green Monkey hostel and asked about their tour options. A man, whose name I can’t remember, said they offered a half day tour to three of the ruins and were quoted the $400 MXN which included the entrance fees for all three sites (approximately $55 MXN for Kohunlich and $67 MXN for both Dzibanche and Kinichna) as well as transportation. We double and triple checked that we got all of this right and when we were satisfied that there were no extra fees, we locked down the plan for the following day. When we arrived the next morning, the only surprise that awaited us was the transportation situation. My husband and I, along with the guide and three other people would be squeezing into a 1976 Chevrolet Monte Carlo. We shouldn’t have been surprised but were and got a good laugh out of the situation. It worked out fine in the end. We had a great time touring the countryside, visiting the ruins, and barely making it over the speedbumps in our lowrider. We also asked around and researched the possibility of taking a colectivo out to the ruins. What we found was that you could get about halfway there which means you would still need to negotiate with a taxi to get to the remote ruins. The bright side to this lack of public transportation is there were few visitors at the ruins when we were there. At all three sites, we were one of two small groups visiting. You can actually focus on the awe inspiring history that is in front of you.